It's Friday, dear friends! Wahoo! Safe to say that this Friday couldn't have come soon enough, as this has been a super exciting, tiring, strange week full of lots of fun and unexpected moments, complete with come-from-behind wins and trips to the bathroom. Even if you aren't a sports fan, it's easy to caught up in the fun, and I'm loving it. Check out this week's highlights, including conferences, a day off, and lots to celebrate! Let's Go Royals! Cheering at a game in early September. Y'all, post-season baseball is FUN with a capital F. Last year, our KC Royals won a crazy, come from behind, everyone thought it was over Wild Card game. This lead to a roller coaster of a playoff run where we literally didn't lose a single game until the World Series. 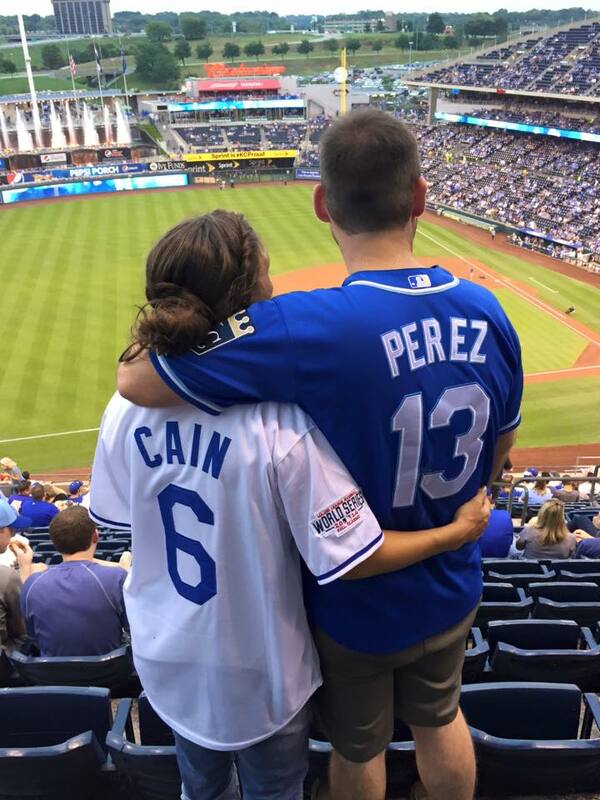 Let me put it this way...Aaron and I made a joking bet the night of the Wild Card game that if the Royals won the World Series then we would have a baby. Let's just say, when the Royals were in game seven with Gordon 90 feet away from scoring, our bet was feeling just a bit scary :) I'm sure we weren't the only ones making such a bet, and I would guess there are a few other making the same bet this year! Hoping that the Royals will take care of business and win it all this year. Either way, these boys are fun to watch, and their awesome comeback and eventual clinch against the Astros has our whole city shooting off fireworks, shaking champagne bottles, and celebrating nightly in new playoff gear. I love my city, and it's even more fun and special right now! 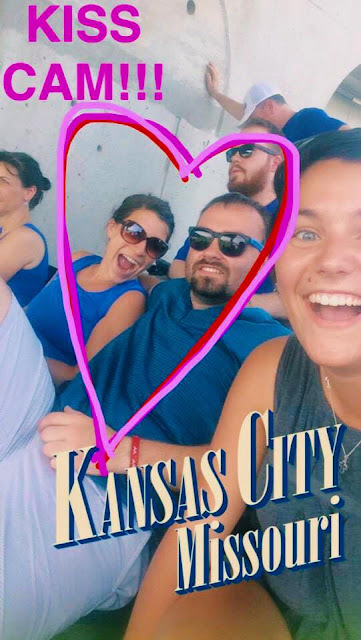 Getting on the Kiss Cam at the Royals is on Aaron's Bucket List. No success this summer. 2. The end of it all. 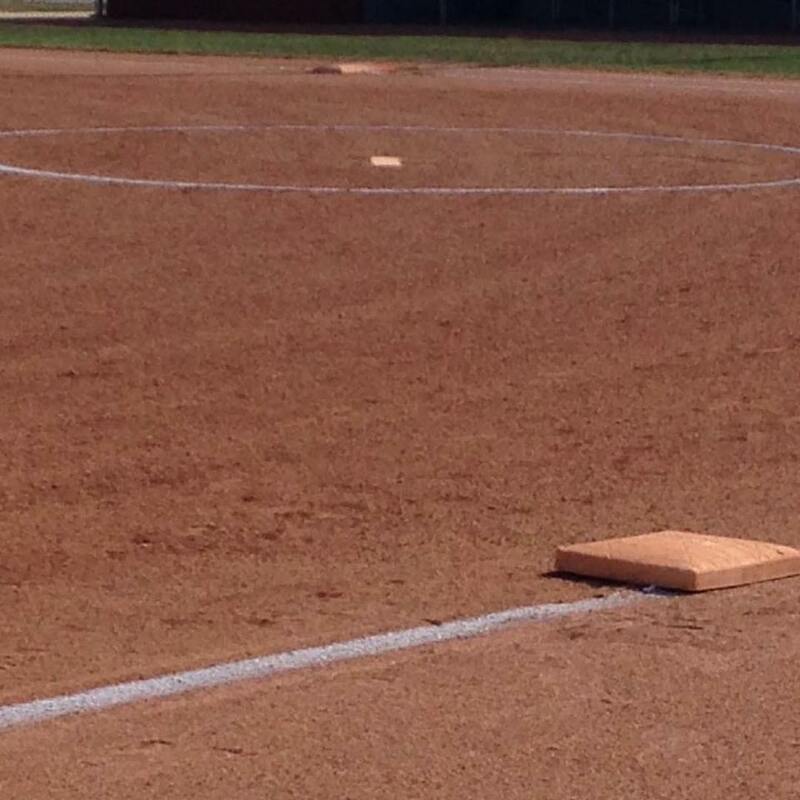 It's never fun to see a bunch of senior girls lose the last game of their High School career. I remember the feeling all too well, the regrets, the what-if's, the replaying just one ball or hit with a different outcome in your mind. The tears falling freely at the ending of a chapter that you'll never get to re-do. 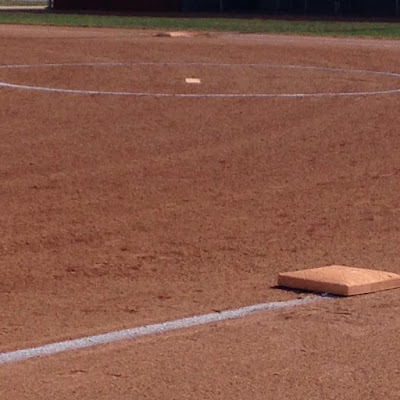 That's how the sectional softball game Wednesday night went down. After holding a 1-0 lead almost all game, the other team scored a run and then sealed the win with a homer to beat us 2-1. I'm so proud of the girls, but really feel for them. Overall, it was a great season and I'm sad to see it end, but am looking forward to more free time. 3. Bears vs. Chiefs Game- A Family Affair. My dad was born in Chicago and grew up there, so my family has always had the "privilege" of being Bears' fans. Basically this privilege includes a whole lot of heartache and a whole lot of losing, coupled with a few bright spots here and there. My hubby is a Chiefs fan, and I happily cheer for them in every game....except when they play the Bears. It only happens every four years, and only happens in KC every eight, so this year we bit the bullet and decided to go. My mom, dad, brother (who is the world's Biggest Bear Fan), aunts, uncle, and cousin all came along. 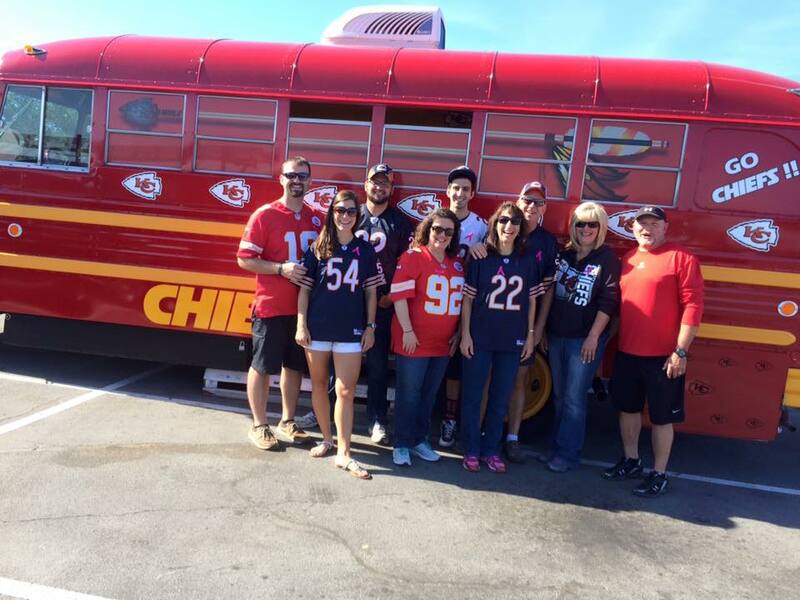 We got to spend the morning tail-gating outside my uncle's brother's Chiefs bus, and I tried to keep my cheering under control when the Bears pulled off a last-minute win over the Chiefs. Woo! All sorts of happy in this picture. Love it. Thanks to softball practice, I got out of two hours of parent-teacher conferences each night. But for the other two hours on Monday and Tuesday, I hung out in my classroom and talked with parents all night. This was the first year we had them scheduled in our rooms, instead of all together in the commons with separate tables. I was a little weary of the new idea, but it ended up working well. And the best part is that we don't have school today. Looking forward to a long weekend where I actually get to sleep in! My freshmen just finished To Kill a Mockingbird, so I borrowed a copy of Go Set a Watchman and I hope to get some of it read this weekend. Also hoping it doesn't ruin my affection for the original book... we shall see. Living it up in my classroom for "Nerd Day" on Homecoming Week. 5. Home sick- a rare occurrence. In a strange series of events, I came to school on Monday and then found myself feeling super sick and dizzy. My sight was spotty and I felt like I needed to puke. I sucked it up long enough to write half day sub plans and run to the bathroom a few times. (By the way, not pregnant, if you were wondering). I have only been gone five times in five years, and a couple of those were for weddings, so I very rarely get sick enough to miss school. I successfully made the drive home, where I popped some Tylenol and spent the rest of the day sleeping and half watching the Royals big comeback game. Thankful for helpful teacher friends, understanding kiddos, meds, sleep, and feeling better. I hope you all have a wonderful week, full of lots of fun moments to celebrate and really make the most of. Don't take anything for granted this week- there is so much we are blessed with on a daily basis that just passes us by sometimes. Live fully, love fiercely, and learn fearlessly, friends! I'm linking up with A. Liz Adventures, What Joy is Mine, The Diary of a Real Housewife, Uniquely Unfolded, Grace and Love Blog, Happy Home Life Linky, Motivational Monday, Purposeful Faith, Modest Mom Blog, Me, Coffee, and Jesus, Running for Cupcakes, Intentional Tuesday, Momfessionals, Life in Leggings, Weekend Retreat Link Party, Just Another Linky,Testimony Tuesday, Tell it To Me Tuesday, A Wise Woman Builds Her Home, Coffee for Your Heart, Bliss and Faith, Painted Teacup, Giving Up on Perfect, Twinkly Tuesday, Tuesday Talk, and DIY Vintage Chic. Oh no, sorry to hear they lost their last game... :( I played softball in HS and know the feeling all too well... Feel better!! It was definitely heart-breaking. I wasn't around for the other three years of their career, but I just remember how much it stunk...especially when they played a really great game. Thanks for your well wishes and for stopping by! I don't have much allegiance to the Bears, but I do have a high school friend who plays for them, so I usually want them to win. I was cheering right alongside you on Sunday! That's so fun Abby!! Who is your friend? Thanks for cheering along with me! There were a lot of Bears fans there! It's so awesome when you home team makes it to the post season!!! Enjoy it. It definitely is! We've been Royals friends for years and years without much success, so it's even more fun to experience a little bit of the fun :) Thanks for stopping by! Headaches are no joke. I've been getting a lot of sinus headaches lately. boo. I grew up in Chicago but I have slowly joined my husband and have become a Packers fan. haha. It is definitely rough :( But they had a great year! Thanks for stopping by! That's amazing you have only been out 5 times in 5 years! I always get sick, or have family emergencies, or need to travel to visit family and use up my "sick" days. 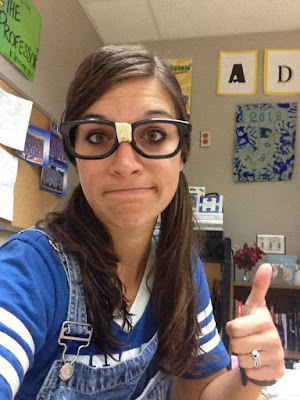 Nerd day looks like fun! Well thanks! I feel like I randomly get sick on the weekends or over breaks, ha. It will be so nice to have all the days someday when we have a baby though- I'll get paid while I'm staying home :) Nerd day was a blast! 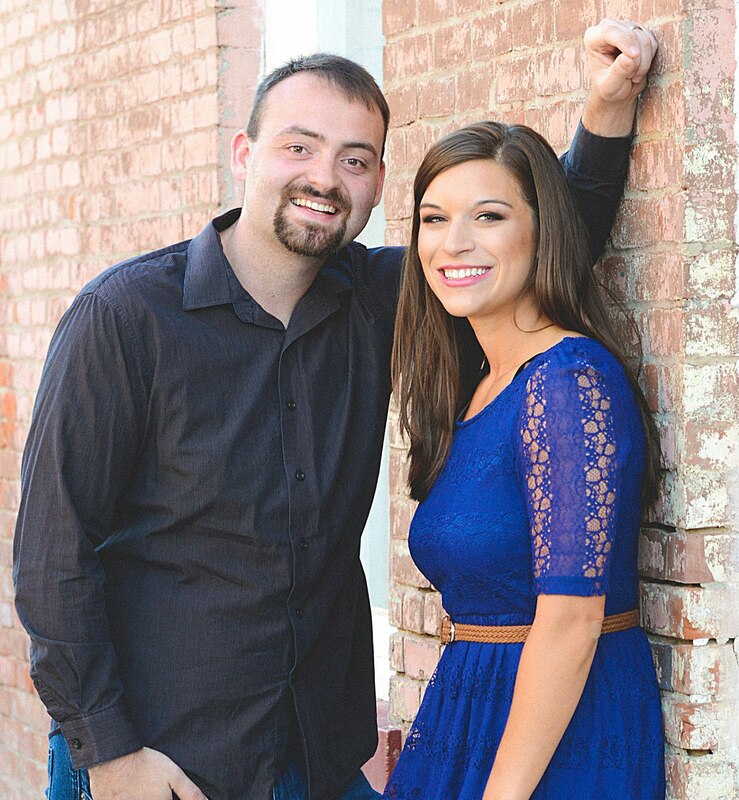 Hi Kelsie: I'm so glad you join us over on LFEO and I wanted to say I LOVE your new picture !! So beautiful ! Oh Amanda, you're way too sweet! Thanks so much! We had a BLAST taking all the pictures! Well thanks so much! It has definitely been a fun fun week! As a huge sports fan myself, it sounds like an amazing week with your family! We lived in Kansas City for a few years growing up. I became a big George Brett/Royals fan before moving to Texas. I would love to see them win the World Series this year! Also since you have Chiefs fans in your family, I must thank you for that whopping they put on my Patriots last year. We are a better team because of it:) Hate that my former Longhorn Jamal Charles got hurt but Lord wiling He will be back. Thanks for sharing such a fun post this week. May God bless you and yours in all your endeavors and have a wonderful week! How fun is that, Horace?? Loved reading this comment. Thanks so much for sharing! George Brett is the man! We are one game away!! Hopefully tomorrow is the day. Hoping Jamal is better soon! Thanks for having me :) Have a great week! Sorry your full week ended with not feeling well. Thanks for sharing your highlights. I enjoyed the pictures. Feel better soon. Thanks so much for the well wishes- feeling much much better!! Valerie, well thanks so much for reading! It is definitely so so sad to see them lose. Hope you're having a great week! Nice. A little note, most the Royals coaching staff has ties to my home area-the S.F. Bay Area. Bullpen coach Doug Henry went to my high school.